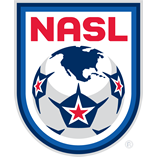 Minnesota United defender Justin Davis, New York Cosmos midfielder Leo Fernandes, and Fort Lauderdale Strikers forward Stefano Pinho all played starring roles in their team’s victories – as well as providing goals. 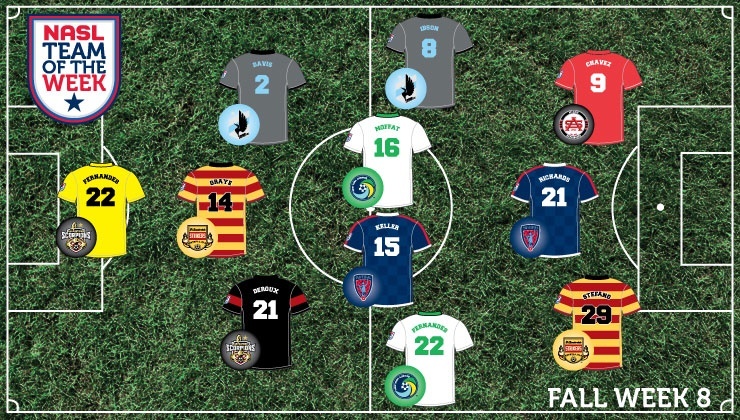 Their performances earned them Team of the Week honors. GK: Daniel Fernandes (San Antonio Scorpions) – The Portuguese international had a major impact in the Scorpions’ win. Making four saves in the match, Fernandes kept his first NASL clean sheet in a 1-0 win against Jacksonville Armada FC after recently joining the club on loan from Dutch side FC Twente. DEF: Justin Davis (Minnesota United) – The Arizona native played a key role in the Loons’ 3-1 win at the Tampa Bay Rowdies. Davis started a counter in his own half before making a gut-busting run and eventually latching onto Ibson’s through ball for a goal. In the match’s waning moments, the defender once again got into the attack, providing the assist on Daniel Mendes’ tally. DEF: Jordan Graye (Fort Lauderdale Strikers) – Slotting into the middle of the defense, Graye helped shut down a dangerous FC Edmonton attack. The Washington, D.C., native used his strength and aerial ability to limit the Eddies to three shots on target and helped goalkeeper Josh Ford to his first clean sheet in the NASL. DEF: Stephen DeRoux (San Antonio Scorpions) – The Jamaica native has been a fixture in the Scorpions’ defense and was rock solid once more against Jacksonville. Having to keep tabs on plenty of quick, attacking players, DeRoux helped San Antonio to a shutout and a crucial three points. MID: Ibson (Minnesota United FC) – The Brazilian was seemingly everywhere on the field in the win against the Rowdies. Finding the back of the net in the first half, Ibson provided the assist on what proved to be the winning goal after Davis’ near full-field run. MID: Adam Moffat (New York Cosmos) – The Scottish midfielder again provided some steel in the center of the field, but also chipped in with a goal as well. Moffat continues to have a growing role and impact in the Cosmos’ lineup. MID: Daniel Keller (Indy Eleven) – The Indiana native provided two strong performances for his hometown side in two victories. Playing a defensive midfield role rather than in the defense, Keller helped Indy to a 2-0 shutout victory against the Rowdies in a midweek clash and a 1-1 draw with the Atlanta Silverbacks later in the week. MID: Leo Fernandes (New York Cosmos) – Once again the spark for the Cosmos’ attack, Fernandes started the comeback for New York. It was a team-leading seventh goal for Fernandes, who grew up on Long Island. He then turned provider, playing a long ball to Lucky Mkosana, who finished with a scintillating volley in the club’s 3-1 win at the Carolina RailHawks. FWD: Jaime Chavez (Atlanta Silverbacks) – Trailing by a goal, Chavez beat Indy Eleven goalkeeper Kristian Nicht to the ball and flicked it toward the goal. The ball heading toward the net created havoc for the Indy defenders before being turned into their net for an own goal. The California native was an attacking threat throughout the 1-1 draw. FWD: Dane Richards (Indy Eleven) – In two games in Week 8 for Indy, Richards tallied in both. The Jamaican international beat Tampa Bay goalkeeper Matt Pickens with a low shot in the club’s 2-0 win and then converted from the penalty spot in the draw with the Atlanta Silverbacks. FWD: Stefano Pinho (Fort Lauderdale Strikers) – Scoring twice at Clarke Field, the Brazilian moved within a goal of the league lead. Pinho now has found the back of the net nine times and continues to be the fulcrum of the Strikers attack. He first scored from the penalty spot before firing his second minutes before the final whistle in the victory over the Eddies.